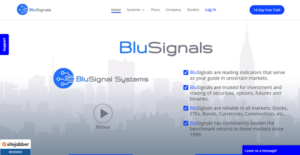 BluSignals is a trade indicator system designed to help investors, brokers, and traders in the stock market by supplying them with insights on two critical factors – Trends and Pivots – allowing them to have a clear picture of the price’s direction and at which point the price will turn (upward or downward). BluSignals utilizes proprietary technologies that include fractal geometry and mathematics and neural network approach to analyze and interpret raw market data and turn them into guiding indicators that help users make decisions regarding investing or trading securities, options, futures, and binaries. Simply put, BluSignals provides users with predictive indicators that aid them in anticipating changes of both prices and trends in the market, a highly distinctive edge given for those who make crucial stock decisions, such as when to sell, when to hold on, and when to buy. BluFractal utilizes BluSignals’ proprietary fractal algorithm to enable you to discern a new trend right at its infancy phase as well as identify the direction of a new trend right before it turns. If you dabble in stock and ETF trades, option positions, FOREX, futures, and binary contracts, being able to predict when the trend is going to make a turn is vital. Equipped with such valuable insight, you are able to make quick decisions that will drastically improve your returns over time. Your trade accuracy is greatly improved and your profits will skyrocket. With BluNeural, you have a proprietary system that implements a neural network approach for analyzing and understanding investment data flows, making it capable of “sensing” when the Buy Zones, Sell Zones, and key market pivot points are approaching. What this provides you is the ability to quickly act and respond to price reversals as they occur and not after the trends have turned. The stock market is full of twists and turns and BluNueral alerts you of them, giving you the confidence to make critical decisions at the right moment. The BluQuant System incorporates both the power and insights of BluFractal and BluNeural to track and predict trends and detect pivot points. Also, it utilizes a risk analysis algorithm to identify which securities to trade. Simply put, what you have is a system that tells you which trades are the best and when to trade. This results in consistent investment success for you. What Problems Will BluSignals Solve? 1) Traders and investors are often unable to depict how the market is going to turn with real-time and lagging indicators. By using predictive indicators, it substantially reduces risk. 2) Traders and investors often use charts and analytics to predict a stock. However, this may lead to some uncertainty and missing data. The trading signals are able to show a different perspective or dimension to the trade signals. 3) Novice traders who are uncertain how to position in the market can use the quantitative analysis to define how the market is going to move and know exactly when and how to invest based on the predictive trading signals. Each enterprise has its own characteristics, and may require a special Accounting Software solution that will be adjusted to their business size, type of customers and staff and even individual niche they cater to. It's not wise to count on finding an ideal solution that will be suitable for every business regardless of their history is. It may be a good idea to read a few BluSignals reviews first and even then you should keep in mind what the service is intended to do for your business and your employees. Do you require a simple and straightforward solution with just essential functions? Will you really use the advanced tools needed by pros and big enterprises? Are there any particular features that are especially beneficial for the industry you operate in? If you ask yourself these questions it will be much easier to get a trustworthy service that will match your budget. How Much Does BluSignals Cost? BluSignals has three systems and offers a simple enterprise pricing scheme for its unique product plans where you can choose one system, a combination of two systems, or all three systems in a single package. BluFractal – A proprietary system that utilizes fractal geometry and mathematics to accurately ascertain the near-term and long-term direction and trend of a tradeable security. BluQuant – A long-only proprietary system that selects from Large-Cap stocks and ETFs to provide specific and detailed real-time Buy and Sell signals for intermediate-term investing. We realize that when you make a decision to buy Financial Reporting Software it’s important not only to see how experts evaluate it in their reviews, but also to find out if the real people and companies that buy it are actually satisfied with the product. That’s why we’ve created our behavior-based Customer Satisfaction Algorithm™ that gathers customer reviews, comments and BluSignals reviews across a wide range of social media sites. The data is then presented in an easy to digest form showing how many people had positive and negative experience with BluSignals. With that information at hand you should be equipped to make an informed buying decision that you won’t regret. What are BluSignals pricing details? What integrations are available for BluSignals? BluSignals has a complete search feature, with data feeds that showcase the real-time information of price and volume within the market. BluSignals also provides a chart analysis tool, which allows traders and investors to use traditional systems for analysis, such as the MACD. Traders and investors can also find Market Watch news and other relevant information to help depict how the market is moving. If you need more information about BluSignals or you simply have a question let us know what you need and we’ll forward your request directly to the vendor.